The whole interface for this feature is terrible! It has almost no useful information for the poor moderator. "Source"? "Target"? No matter so many tag merge requests have come out backwards that I've seen. The poor moderator has to take a stab in the dark. 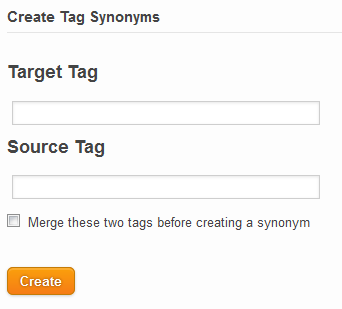 Why not call one "Synonym" and the other something like "Main tag" or whatever? Would an option to revert/undo when a tag merge was applied "backwards" make sense and fit into the interface? Are the old tag wikis for the tags which have now become mere synonyms still stored in the database somewhere? Could we add a way to import/reinstate a tag wiki from a synonym to the new main tag? Could it work even for synonyms made some time ago? OK some of that is not strictly necessary but might help the mod and won't be hard to implement. But some of it I think is really essential. Browse other questions tagged feature-request user-interface tag-synonyms moderator-tools . Could the tagging system be enhanced to support tag synonyms? Can we allow 7.5K users to suggest tag synonyms without a score of 5 in the tag?